The older strippers that have a set of holes in them allow you to choose how much force will be applied to the tubing, so you can avoid crushing the tubing while cutting. Ian - Was thinking about how you could use a wire stripper for cutting tubing then realized that those strippers have a tapered cutting edge ending at the hole and usually will cut tubing much smaller than 1/16th. Great idea. I have been using a wire stripper to cut my aluminum tubing for awhile now and it works well. But brass is another matter. For everybody who has been cutting small tubing with an Xacto knife and not catching the off cut, here's some help. Made a trip to the U.S. (my wife and I live about 10 miles from the Detroit border) and made a stop at the Hobby Lobby looking for something else but happened along to the small tools, etc. 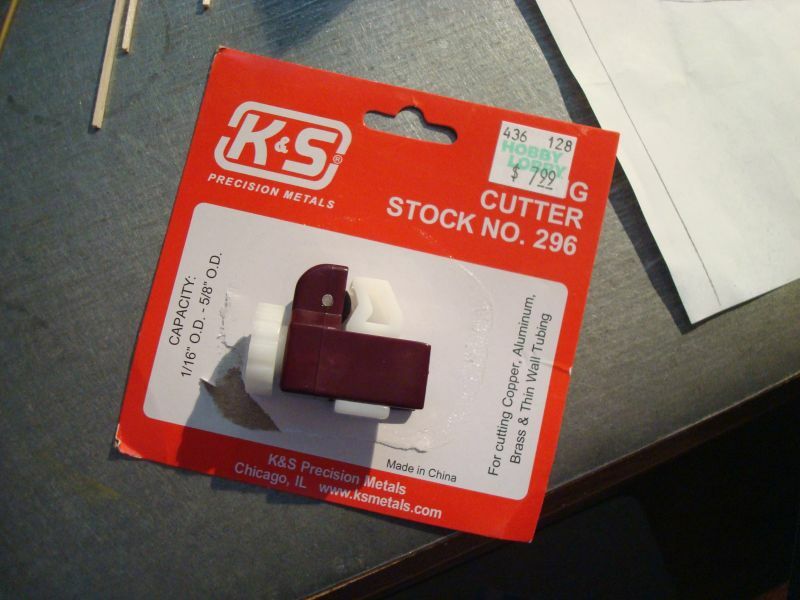 and found a K&S tube cutter that will cut aluminum and brass as small as 1/16 to 5/8 diameter. It has a very smooth delrin base and a steel cutting wheel and allows for a very smooth operation and not at all hard to hold the tube while cutting. Tried it out this morning and the off cut is very smooth with a slight taper that is easily filed off.